Embark on your own fun adventure on the Lewis and Clark National Historic Trail following their fabled route along the Missouri River. Share the Corps’ excitement as they launched their boats from St. Charles to begin their Great Adventure and marvel as they did at the beauty of the land all around. features the iconic Gateway Arch stands as a beacon for visitors to St. Louis and the region. Standing 630-feet tall, it is a lasting symbol of Thomas Jefferson’s vision of American growth and westward expansion. Directly to the west of the Arch is the Old Courthouse, which was the site of the famous Dred Scott trial and provides visitors with numerous displays and artifacts related to the founding of St. Louis and its history. 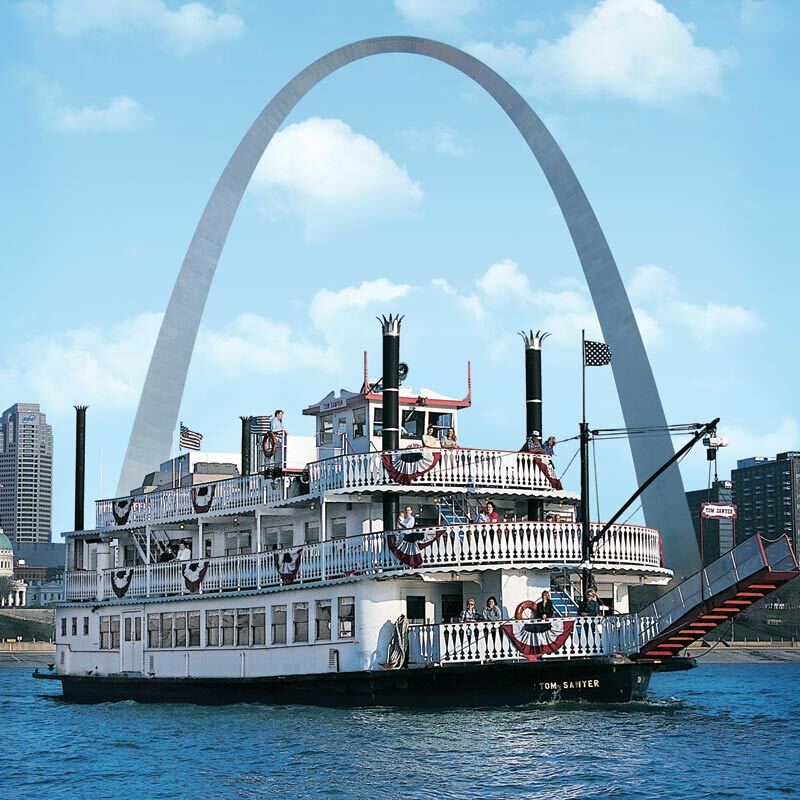 Views of the Arch are also available by riverboat cruise, the Arch grounds and riverfront. Just to the north of the Arch is historic Laclede’s Landing, which is the northern part of the original settlement founded by Frenchman Pierre Laclede that would become Saint Louis. West of downtown St. Louis is historic Forest Park, the site of the 1904 World’s Fair. This 1,371-acres park is home to some of St. Louis’ most prized attractions, including the Missouri History Museum, the world-famous Saint Louis Zoo, Saint Louis Science Center, Saint Louis Art Museum and the Muny outdoor theatre. Located just 10-minutes from the Gateway Arch is Anheuser-Busch Brewery. In close proximity is the Soulard neighborhood, one of the oldest communities in St. Louis, which hosts major festivals, events and night-life. The historic Cherokee Street with its unique antique shops, the Chatillon-DeMenil House and Benton Park are nearby. Powell Hall (home of the Saint Louis Symphony), the Fabulous Fox Theatre and Saint Louis University are all part of the Grand Center, the cultural center of St. Louis. Located near West Alton is the Edward “Ted” and Pat Jones-Confluence Point State Park. This is where the Mississippi and Missouri Rivers merge, and where Lewis & Clark set off on their journey up the Missouri. Interpretive panels and a walking trail portray the challenges faced by the Corps. The park’s wetlands are part of the Mississippi River flyway, making it a great place to see waterfowl, including bald eagles and raptors. Downtown St. Charles is a nationally registered historic district where for over 200 years its residents have been hosting travelers headed up the Missouri River, including the men of the Corps of Discovery who were cheered as they pushed off on their date with destiny on May 21, 1804. 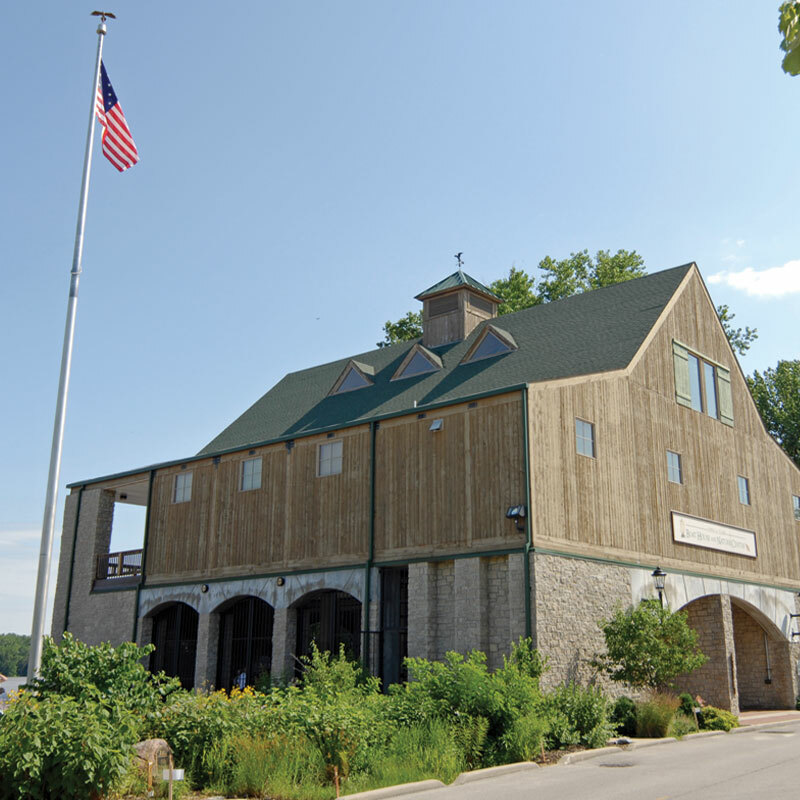 A full-size replica of the Corps’ keel boat and pirogues are in the Lewis & Clark Boat House, Museum and Nature Center at a scenic city park on the Missouri River. A larger-than life statue of Lewis & Clark and a statue of Daniel Boone are nearby. 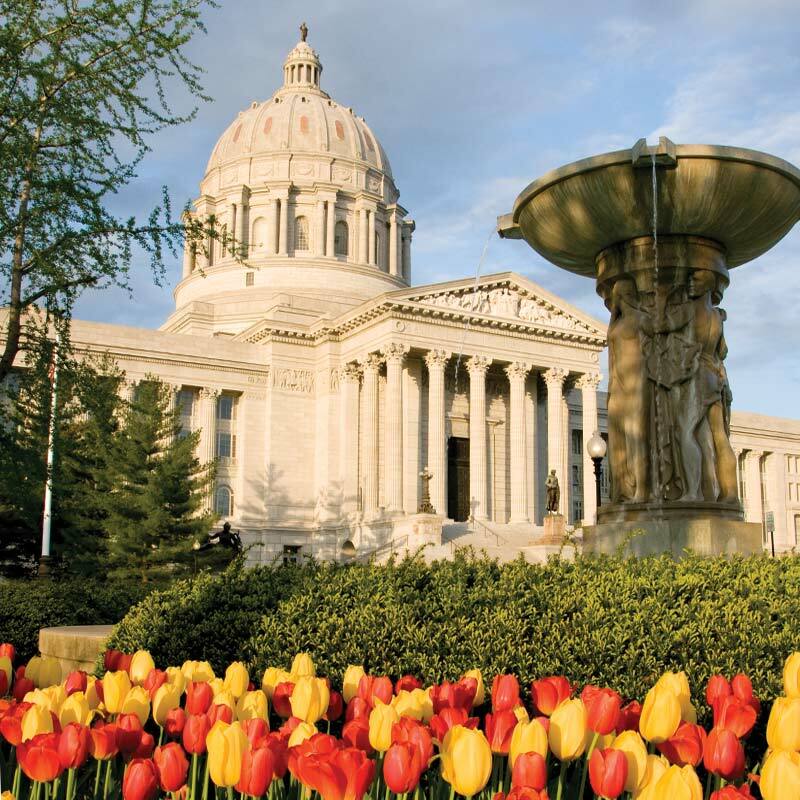 The picturesque downtown area features the first Missouri State Capitol and historic homes and buildings housing one-of-a-kind antique shops, restaurants and art galleries. The Foundry Art Centre features rotating exhibitions and 20 working art studios. 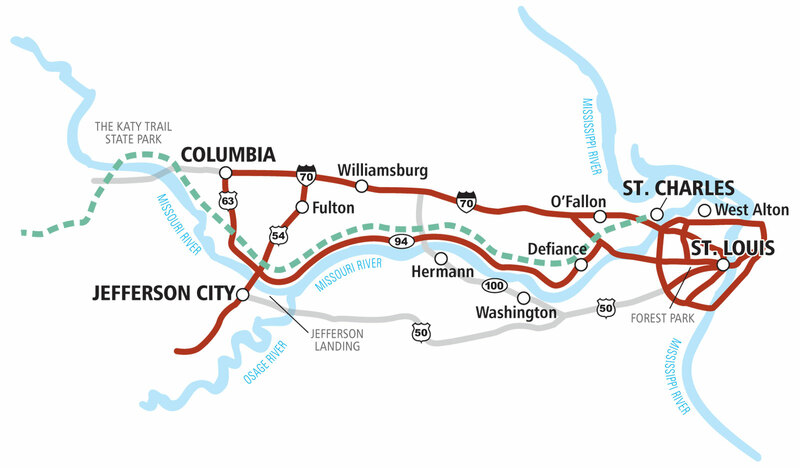 The Katy Trail State Park Hike / Bike Trail begins at St. Charles and follows the former Missouri-Kansas-Texas Railroad right-of-way for 240 miles along the scenic bluffs of the Missouri to Clinton. Defiance features the restored Historic Daniel Boone Home and Heritage Center. Daniel Boone was over 70 years old when Lewis & Clark passed by his home, now restored. The Historic Daniel Boone Home and Heritage Center portrays life on the Missouri frontier. The Fort Charrette Village and Museum is a restored 1790s trading post. The Gary R. Lucy Gallery features paintings from the times of Lewis & Clark. The John Colter Memorial Museum, the Washington Historical Museum and the Meerschaum Corn Cob Pipe Factory (the only one in the U.S.) help bring alive fascinating chapters in Missouri’s history. A variety of scenic wineries and vineyards in the heart of Missouri’s Wine Country make Washington a popular destination. is the historic German community overlooking the Missouri attracts trail travelers to its many antique shops, wineries, gift shops, and inns. The Hermann Inn has displays of famed mountain man John Colter who joined Lewis & Clark on their epic journey to the Pacific. On the return trip Colter chose to be a fur trapper and in his journeys discovered the wonders of Yellowstone. Colter finally came back to New Haven, near Hermann to settle. is named for the nation’s third president, whose superb vision sent Lewis & Clark and the Corps of Discovery on their quest to find a route to the Pacific Ocean. Thomas Jefferson’s imposing statue at the Missouri State Capitol and the Lewis & Clark Statues at Trailhead Plaza on the Capitol grounds remind visitors just how important the Lewis & Clark National Historic Trail is to Missourians, and all Americans. Displays in the State Museum inside the Capitol and the Thomas Hart Benton masterpiece mural in the House Lounge emphasize that pride. Jefferson Landing is only a block away, with a unique museum in the historic 1839 Lohman Building and the 1855 Union Hotel and its Rozier Gallery nearby. The Missouri State Penitentiary and museum has fascinating exhibits on famous criminals. Hike/bike travelers on the Katy Trail have access to Jefferson City’s attractions including the Runge Nature Center trails and wildlife exhibits. The Museum of Missouri Military History and the Cole County Historical Museum are also popular stops. Columbia is the largest city in central Missouri and offers an outstanding variety of attractions, events, and experiences. Columbia is home to the University of Missouri and has a number of cultural, historic, and entertainment venues. The State Historical Society Art Galleries showcase Thomas Hart Benton and George Caleb Bingham paintings. 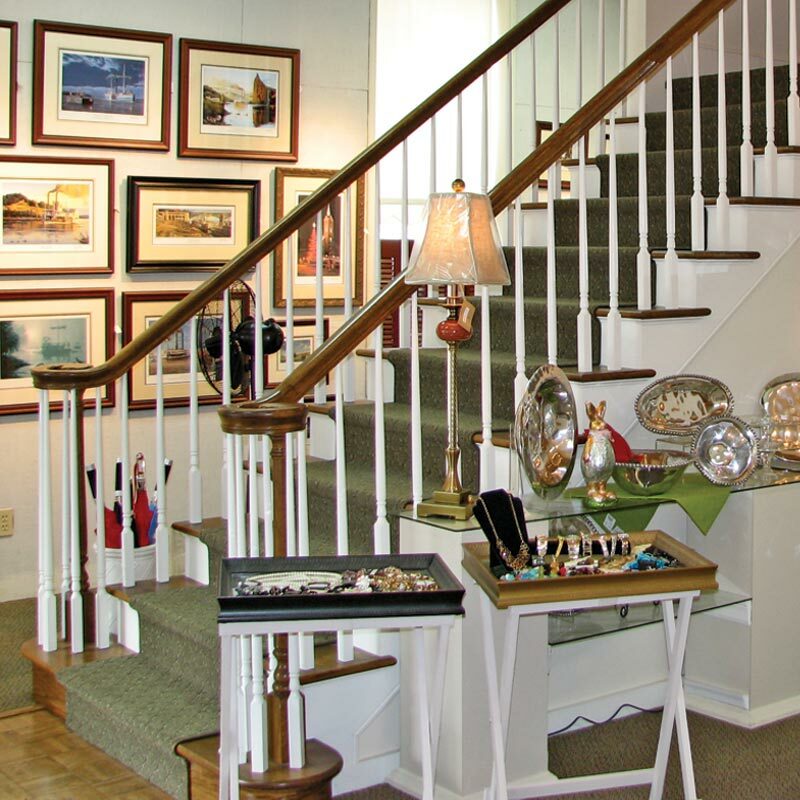 Bluestem Missouri Crafts features the work of over 300 artists and craftspeople. Columbia’s vibrant downtown district includes the North Village Arts District plus an array of dining and entertainment venues. The Martin Luther King Jr. Memorial at Battle Garden features plaques that include quotes from the famed Civil Rights leader. Finger Lakes State Park north of the city has lakes for swimming and boating and trails for off-road biking. Trail travelers can take a side trip to Fulton to visit the National Churchill Museum. It commemorates the historic appearance of World War II Prime Minister Winston Churchill who on March 5, 1946, made the world aware that the deadly “Iron Curtain” split Europe in two during the Cold War face-off with the Soviet Union. Travelers can find plenty of outdoor adventures at the nearby Whetstone Creek Conservation Area, Graham Cave State Park at Danville, the Creek Conservation Area and the Reifsnider Forest at Warrenton en route to St. Louis on I-70. The O’Fallon Log Cabin Museum, the 1812 Fort Zumwalt and the Darius Heald Home recall early-day historic events on the Missouri frontier.